The ‘Lovebomb’ lands at Atomica! 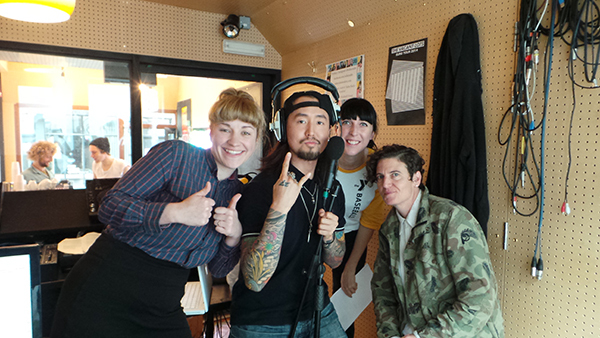 Plus its creators Wendy Meakin and Daisuke Sakaguci join us on Soho Radio for ArtBeat #5. If you have visited Atomica recently you will have noticed a stunning new addition to the gallery: The Love Bomb! 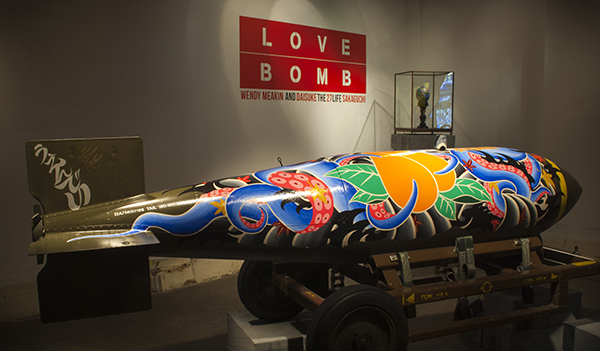 A collaboration between C4 ‘Four Rooms’ dealer Wendy Meakin and artist Daisuke Sakaguchi, aka THE 27 LIFE, The Love Bomb is a 1960’s British military test bomb that has been transformed into a beautiful symbol of peace. 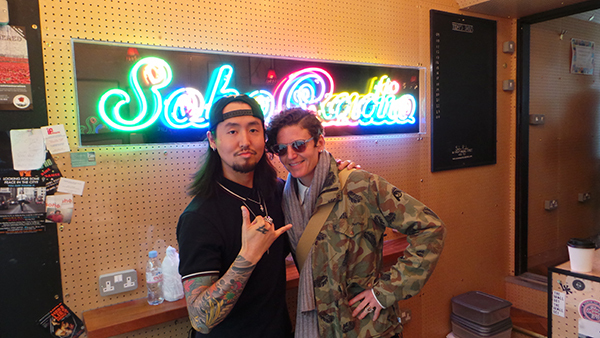 After purchasing the bomb on ‘Four Rooms’ Wendy approached Daisuke, her student over a decade ago at Central Saint Martins, and the pair came up with a poignant design concept to completely transform the bomb. Known for his distinctive Japanese Tattoo motifs Sakaguchi hand-painted it incorporating traditional Japanese symbols of Love including an octopus and a peach. Once a military memento, the bomb has now taken on a new lease of life; an embodiment of the message infamously advocated by Yoko Ono, ‘Love against Hate’. Our current exhibition ‘Home Sweet Home’, joint solos from artists Angela Dalinger and Nicholas Stevenson, runs until 11th September – so you have just under two weeks to come along and check it out if you haven’t already! Thanks to everyone who made it along to the opening reception, it was another top night at the gallery with lots of sangria and great tunes from DJ Gary the Tall. Here is the brilliant ‘Home Sweet Home’ opening night video, shot and edited by Mike of Video Arcade Productions. We love Mike’s videos so much and this one is super-cool! Mike also took some photos of the night, see them over on our Facebook page. We have a brilliant new show opening at the gallery this week! ‘Home Sweet Home’ is a joint solo exhibition of new paintings from Angela Dalinger (Germany) and Nicholas Stevenson (UK). Since discovering each other online, the pair have become virtual friends with a massive appreciation for the the other’s artwork. 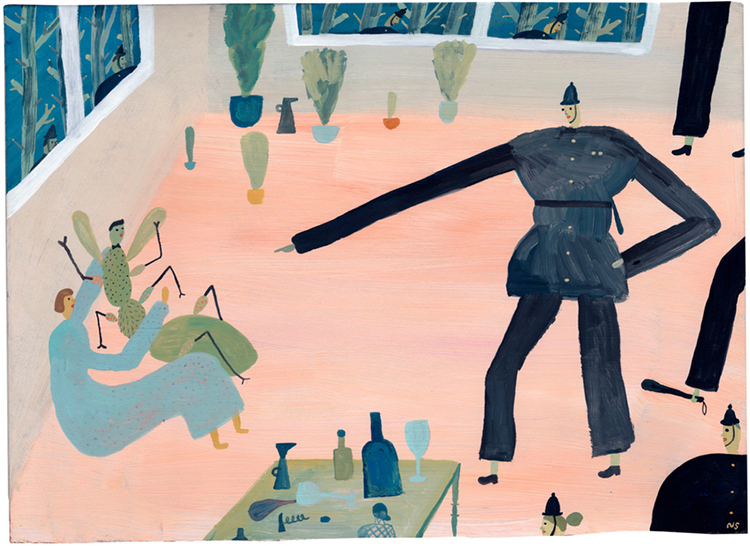 Keen to collaborate, they came up with a concept for an exhibition that offers viewers a snatched glimpse into a series of imaginary homes, allowing us to indulge in our voyeuristic inclinations… Working on their paintings individually but from shared ideas, the result is a delightful show of surreal and spooky abodes full of intriguing characters and unexpected scenes. A total visual treat! For this painting, I simply started with the background and a plan to paint two houses on it. 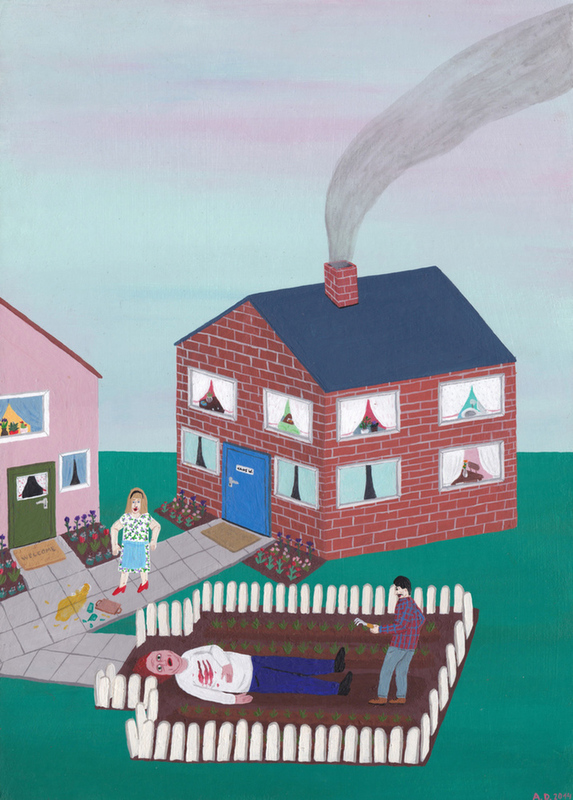 When I had finished the garden, I wanted to paint someone dead or bleeding in it. The figure became accidentally way too big, so I thought I either had to make the other people too big too, or make the dead person a giant. I’m always afraid I’ll paint people too big and they won’t fit through their doors. Thats how this painting came together. This was an intuitively painted piece, planning as I went. 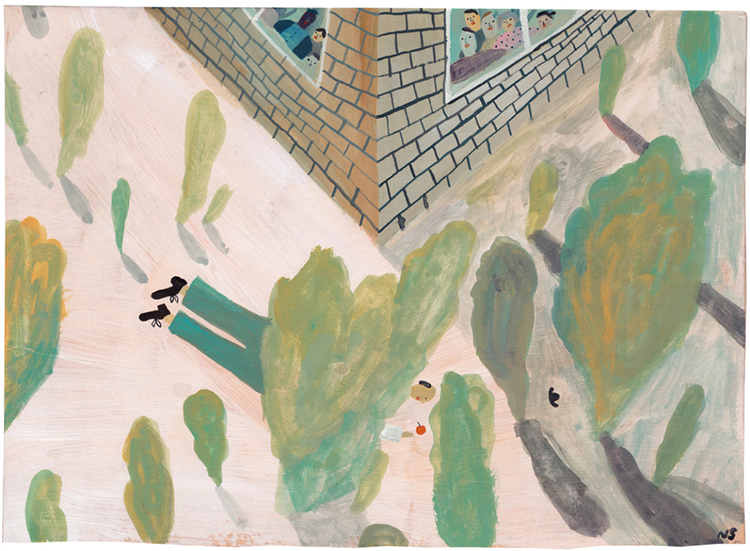 I painted the building, and the children at the window, then the bushes and their long shadows. I knew they had to be looking at something outside, so then this pathetic and endearing old man who fell over appeared… I’ve been laughing at him ever since, poor guy. He may get his own children’s book one day. 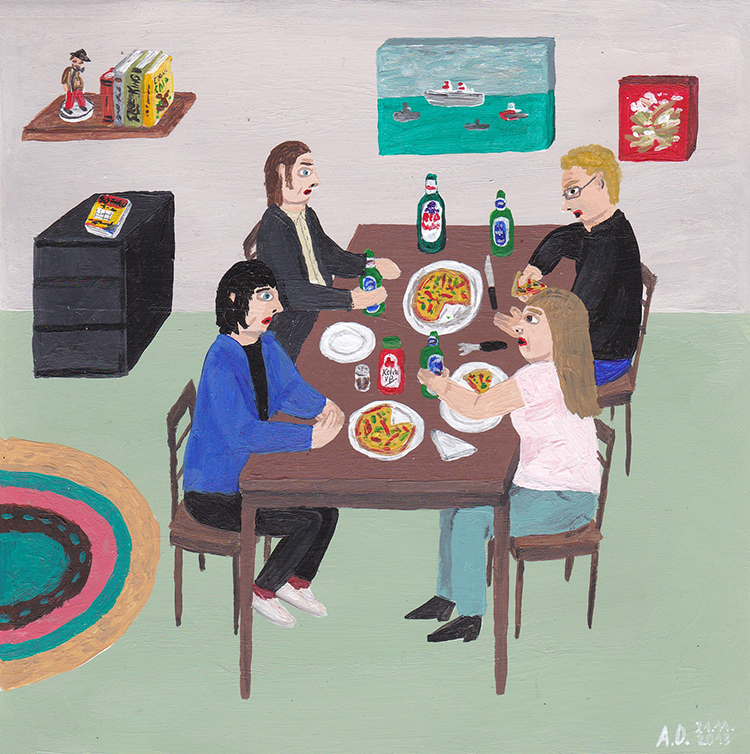 I started this with the idea of a table scene, pretty often there are self-portraits in my paintings, I’m the one with the blue cardigan. I wanted to express uncomfortableness in the people’s faces sitting on the left side. When Angela and I were discussing ideas, she mentioned that she was working on a brothel scene, and I’d just drawn a man trying to swat a giant insect. It was then that I envisioned an insect rent boy. He has a little bow-tie if you look closely. This painting was inspired by a YouTube video with the same scene. I’ve been scared and fascinated by house ghosts ever since I once woke up to see a man in white sports gear peeing in the corner of my room at university. He disappeared as soon I slapped the light switch on. 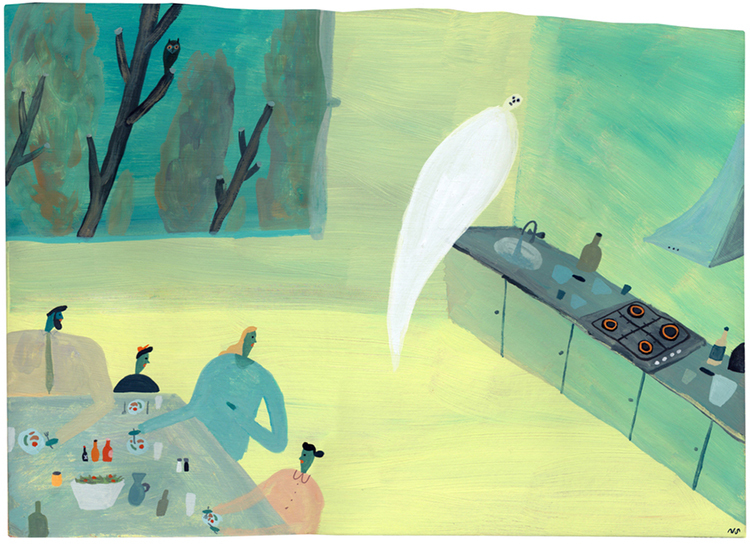 Admittedly I was coming off of some anti-malaria medication, which stated hallucinations as a side effect, but nevertheless, the idea of ghosts invisibly doing mundane, everyday tasks in our homes has both tickled and disturbed me.